Even though soup season has technically come to an end, I still love making soup year-round. 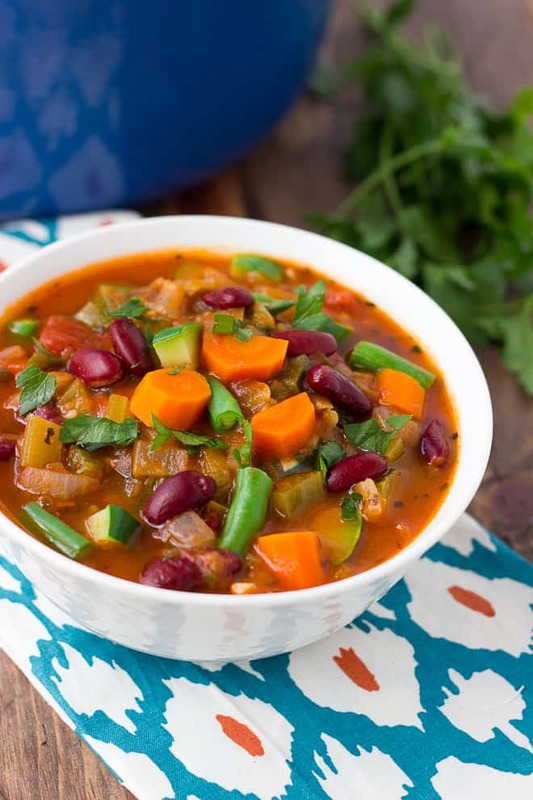 Minestrone soup has its place during the summer because it is full of summer vegetables, like green beans and zucchini. I also add leeks to my minestrone soup because I’m a leek-freak. Leeks make everything delicious! 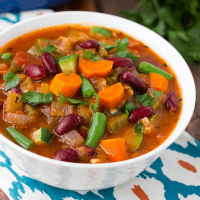 This minestrone is as flavorful as any I’ve eaten at a restaurant. It is full of fresh vegetables and herbs with amazing depth of flavor. I save carcasses from roasted chicken and other bone-in chicken pieces in a large bag in my freezer. Every couple weeks I make a big batch of homemade chicken stock. The health benefits of homemade stock are extensive! It is also hard to find a commercial brand that doesn’t have weird additives. Remember “natural flavor” is actually a sneaky term for MSG-like ingredients. That being said I don’t always have homemade chicken stock around. So store-bought will work fine in this recipe if you don’t have it. On days I make homemade stock, I like to make soup for dinner with the fresh stock. I made an extra-large batch of this soup (doubled the recipe) and packaged it up in quart-sized jars (I use these lids on quart, wide-mouth mason jars) to stock my freezer. That way I have a healthy, on-hand meal when I need it. 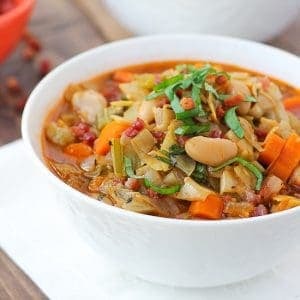 Typically minestrone soup contains small pasta. I’ve made this soup and added small brown rice shells, but I find they don’t really do much for the texture and flavor of the soup. This soup actually reheats better if it doesn’t have any pasta. So I just omitted pasta altogether. However, if you are making and eating all the soup on the same day, feel free to add pasta if you like! 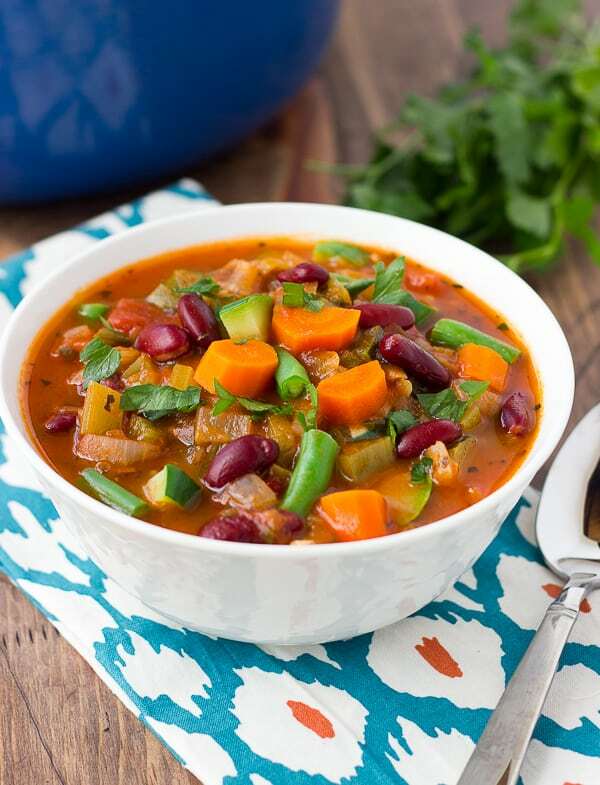 Minestrone Soup! As good as your restaurant favorite. Full of FRESH vegetables and herbs with amazing depth of flavor. 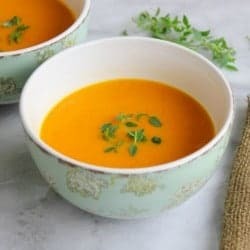 This soup freezes incredibly well! I usually make a huge double batch and freeze a few quart sized jars. Then I have a quick, healthy dinner on hand when I need it. In a large dutch-oven, heat a 2 tablespoons of olive oil over medium-high heat. Add the onion, leek, carrots, celery, 1/2 teaspoon salt, and 1/8-1/4 teaspoon red pepper flakes. Cook for 10 minutes or so, until softened. Add the garlic and cook for 30 seconds until fragrant. Add the tomato paste, Italian seasoning, and sugar. Cook for a few minutes then pour in the tomatoes (including the juice), and stock. Simmer for 10 minutes. Add the beans (drained and rinsed), green beans, and zucchini and cook for another 20-25 minutes, until all the vegetables are tender. Add the parsley and basil and season to taste with salt and pepper. Serve topped with grated Parmesan if desired. Enjoy! *I love using homemade chicken stock because of all it’s health benefits. If you don’t have any homemade chicken stock, I also like the organic kind from Costco. Yuummmm! Can’t wait to try this. Minestroni soup is my favorite. I need more vegetables in my life. Love your blog, Erin! Such a healthy and cozy meal! I love this in the winter time.